Who can Deploy 802.11ac Wave 2 in Multi-Dwelling Units? 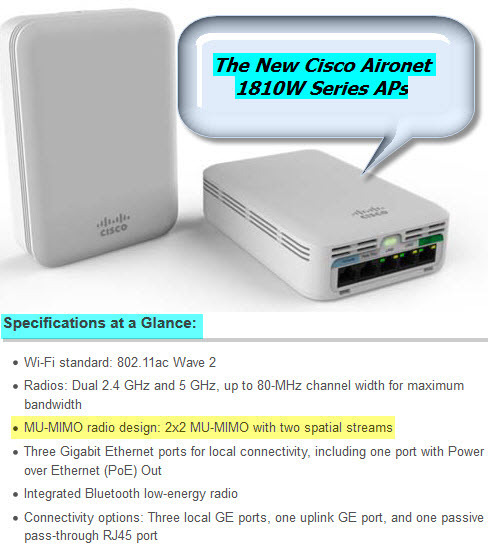 The New Cisco Aironet 1810W Series APs is available now. The 1810W Series help you say goodbye to installation hassles and security woes in setting up wireless access points in your multi-dwelling unit (MDU). Why? It supports 802.11ac Wave 2 standards, is a breeze to install, and has superior security. It supports fast wireless connection, making it ideal to deploy where multiple people reside. Cisco Aironet 1810W Series Access Points provide state-of-the art 802.11ac Wave 2 functionality, along with easy installation and superior Cisco security features. This new 802.11ac Wave 2 functionality can put an end to data bottlenecks or slow speeds that your network may face. Whether you manage a long-term care facility, a hotel, a dormitory, or even a cruise ship, the 1810W Series is an ideal solution to significantly boost network speed. With 802.11ac Wave 2, the 1810W Series provides a data rate of up to 867 Mbps on the 5-GHz radio, exceeding the data rates offered by today’s high-end 802.11n access points. It also enables wired devices to connect to the network without the need for additional investments in cabling infrastructure. The 1810W Series delivers industry-leading performance for highly secure and reliable wired or wireless connections and provides a robust mobility experience. 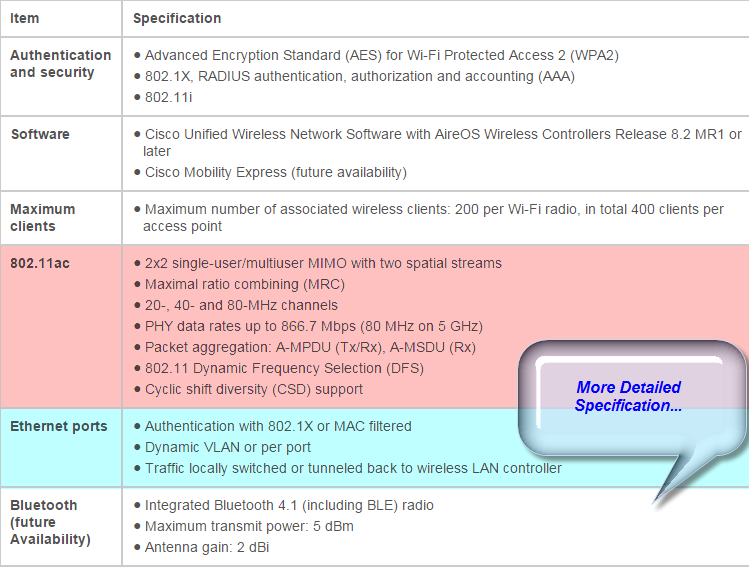 The Table below lists the features and benefits of these access points. MU-MIMO Multiuser (MU) multiple-input multiple-output (MU-MIMO) allows transmission of data to multiple 802.11ac Wave 2–capable clients simultaneously to improve the client experience. Prior to MU-MIMO, 802.11n and 802.11ac Wave 1 access points could transmit data to only one client at a time, typically referred to as single-user MIMO.802.11ac Wave 2 with 2×2 MIMO technology with two spatial streams when operating in single-user or multiuser MIMO mode, offering 867-Mbps rates for more capacity and reliability than competing access points. Gigabit Ethernet ports Three local Gigabit Ethernet ports are available to securely connect wired devices to the network. Traffic from wired devices can be tunneled back to a wireless LAN controller (for compatible controllers) or be locally switched by the access point. One of these Ethernet ports can also provide Power over Ethernet (PoE) out to power a device such as an IP phone or a security camera. Integrated Bluetooth 4.1 Integrated Bluetooth low-energy (BLE) 4.1 radio for location and asset tracking (future availability). Multiple mounting and security options Multiple mounting options to standard junction boxes. You can vertically mount the access point directly on a wall or desk using the optional sleek desk cradle. Physical security is offered with the included Torx screw and the option to add a Kensington lock. Place your access point where you see fit, secure in the knowledge that it isn’t going anywhere. The Aironet 1810W Series Access Points support the latest 802.11ac Wave 2 standard for higher performance, greater access and higher-density networks. With simultaneous dual radios and dual band with 802.11ac Wave 2 MU-MIMO, this access point can handle the increasing number of high-bandwidth devices that will soon become a normal part of the network. The 1810W Series allows wired access via Power over Ethernet (PoE). This feature provides wired access with PoE out for other devices such as IP phones, security cameras, printers and copiers. In addition to standard PoE, the access point can be powered with an AC adapter. The 1810W Series comes with three local Gigabit Ethernet ports, one uplink Gigabit Ethernet port and one passive pass-through RJ-45 port, allowing for a variety of connections. These sleek access points with a small form factor are designed with flexible mounting options in mind. You can mount them directly on the wall or to numerous global wall junction standards or have them desk mounted. They are also easy to install. One key part of Wave 2 802.11ac technology that helps keep your organization ahead of the capacity crunch is multi-user MIMO (MU-MIMO). MU-MIMO allows an access point to transmit to multiple clients at the same time, instead of sending data to a single client at a time. These parallel transmissions improve RF efficiency when client devices also support 802.11ac Wave 2. With MU-MIMO in use, each client device gets the amount of airtime it’s supposed to have based on the technology supported – 802.11ac Wave 2, Wave 1, 802.11n, or an older version of the standard. So the limitation of one lower-speed client no longer slows overall downlink throughput for others. With Wave 2’s extra wireless capacity and spectrum efficiency, you want to be sure that wireless traffic doesn’t face a bottleneck when it hits your wired LAN infrastructure. So Cisco offers the end-to-end infrastructure support and services you need to avoid network traffic jams.